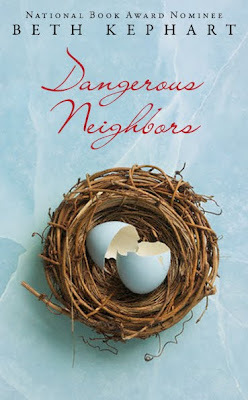 This week's pick is Dangerous Neighbors by Beth Kephart, set to hit shelves August 24 from Egmont. Summary: Could any two sisters be more tightly bound together than the twins, Katherine and Anna? Yet love and fate intervene to tear them apart. Katherine's guilt and sense of betrayal leaves her longing for death, until a surprise encounter and another near catastrophe rescue her from a tragic end. Set against the magical kaleidoscope of the Philadelphia Centennial fair of 1876, National Book Award nominee Beth Kephart's book conjures the sweep and sco pe of a moment in history in which the glowing future of a nation is on display to the disillusioned gaze of a girl who has determined that she no longer has a future. The tale is a pulse by pulse portrait of a young heroine's crisis of faith and salvation in the face of unbearable loss. My Thoughts: The simple cover is definitely intriguing- beautiful and automatically invokes positive thoughts until the title is noticed. The historic setting holds promise to add a unique element and the premise hints at dark elements while still keeping much of it hidden, automatically sparking plenty of questions about the book. I definitely want to know what the event was to tear the twins apart, what happened to Anna and what will happen to Katherine. I'm intrigued...and I love the cover. Great pick! Great pick, it's the second one I've seen today that's been about twin sisters. :) My WOW is at The Crowded Leaf. Love Kephart and the setting is very original. Excellent choice.